A short while, ago it emerged that Google's HTC-made smartphone duo codenamed Sailfish and Marlin could soon launch as the Google Pixel and Pixel XL respectively. The naming scheme, if true, will mark a departure from the traditional Nexus branding, which looks set to be retired. With a month to go until the purported October 4th unveiling, the rumor mill should see plenty of action, and kicking things off appropriately, renowned leakster LlabTooFeR has shared some info regarding the Pixel XL's camera. According to his recent tweet, the Google Pixel XL will roll with Sony's IMX378 sensor for the rear-facing shooter, while the selfie camera will comprise Sony's IMX179. This in alignment with leaked specs, which have suggested Marlin could rock a 12 or 13-megapixel snapper on the back and an 8-megapixel front-facing effort. Though LlabTooFer doesn't mention anything about the smaller handset for now, previous information leads us to believe that both Sailfish and Marlin will employ the same cameras. Not much is known about the Sony IMX378, though its number suggests a generous upgrade over the IMX278 that adorned the Google Nexus 5X and Nexus 6P. The rear shooters of last year's models really did excel, which was particularly satisfying since Nexuses haven't always harbored a strong reputation in this field. It's still early days, but the pieces so seem in place for another laudable photographic performance. Here's very much hoping that HTC, Sony and Google's combined efforts don't disappoint. Not as ugly as the iphone, though. The bezels are just too big on that fruit cake phone. Well Yea, but that's pretty much the only thing Apple excels at these days, ugly phones. So let them have at least that. Hey there's nothing wrong with Tim enjoying a little salad toss. The problem is when he has his fruitcake and makes you eat it too. 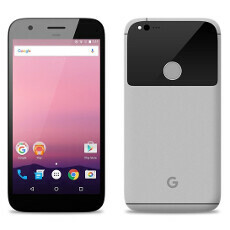 I wonder if Google is going to try their hand a dual camera setup? Since a number of smart phones this year came with dual cameras on the rear. Not ugly, just bland and minimalistic. Does good design them or do they just leave it up to HTC or whoever is making them? October 4th seems ages away. lol. Can't wait until the unveiling. At least I will have football to hold me over. they need to put the fingerprint scaner in front similar to op3 with the two customizable capacitive buttons too. No they dont. All google branded device ( nexus thats will soon apparently be named differently ) use on screen button and when they use fingerprint scanner its in the back always. There is no reason to do otherwise. Does Sony normally produce good/great camera pieces?! Sony make the best mobile camera sensor end of the story. Some other make good one too like Samsung. The back of this phone is very ugly. What ever the camera is let's hope this year they install it the correct way round, the 5x is upside down & all videos are recorded upside down, letting apps rotate it but some still do not. This is going to be a brand disaster, I don't read a lot of enthusiasm about the pixel series even if Nexus doesn't have a glorious brand recognition either. At least very old Nexus models can function decently with recent builds. Galaxy Nexus/S for instance. This just seems like change for the sake of change. And yet Sony still uses years old camera sensor for their own flagship phone. Shame on Sony. Nobody noticed that the main camera of Nexus 5 becomes the front camera of Marlin XL. How technology upgrades.